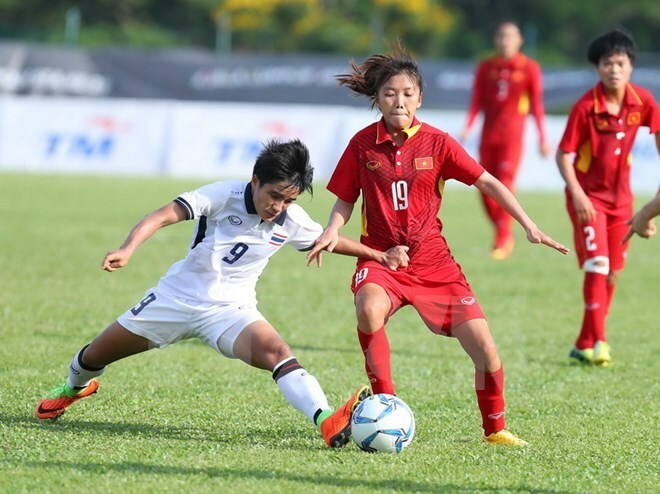 Hanoi (VNA) – Vietnam and Thailand need to play and wait until their last matches are over to know who will win the women’s football god at the ongoing SEA Games in Malaysia. Playing each other in the round-robin format on August 22, they drew 1-1. Midfielder Pham Hai Yen opened the score for Vietnam just 12 minutes after the first whistle and Thailand leveled the result near the end of the first half with Thongsombut finding the far corner of the net past goalkeeper Dang Thi Kieu Trinh. Vietnam will play Malaysia while reigning champions Thailand will meet the Philippines in the last matches on August 24. Coach Mai Duc Chung of Vietnam said he is not satisfied with what his team did as they missed many chances to score. “Some players did not do their job well. They lost the ball and they wasted the opportunities. We were not lucky this match,” said Chung, adding that they would fight harder in their last game. Chung said the way for Vietnam to win its fifth SEA Games gold is clear. The players had to score as many goals as possible to get a goal difference advantage against Thailand. The team with more determination and better tactics will be the champion, he said. Coach Spencer Prior of Thailand said the draw result was logical. Thailand had dominated the first half but been tired towards the end, he said. He believed his team could defend their title although their match would be played before the one between Vietnam and Malaysia. In August 22’s football matches between the male teams, Vietnam failed to defeat 10-man Indonesia, the game ending in a goalless draw.